On Nov. 11, a special Super Mario Bros. 25th Anniversary Wii system will hit the streets in Japan. 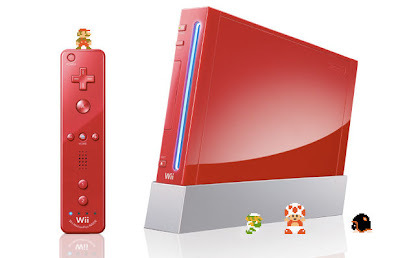 For ¥20,000 (approximately $240), Japanese gamers will get a shiny new Wii system, a Wii Remote Plus, a nunchuck attachment and what appears to be a special anniversary version of the original Super Mario Bros.
Oh, and by the way: The Wii, Wii Remote Plus and nunchuck attachment will be red. Although Nintendo's American and European arms have thus far refused to talk about any Super Mario Bros. 25th Anniversary releases for their respective territories, it seems the floodgates may open shortly. The brass at Nintendo of Europe, for instance, recently let it slip that a localized version of Japan's Super Mario Collection Special Pack--to be called Super Mario All-Stars 25th Anniversary Edition on the Continent--will be released on Dec. 3. Wait, this is already out?